The GD&T Flatness symbol references how flat a surface is. It is not dependent on any other datums or features. Flatness is a form control, because it is used to control the form or shape of a feature. It controls how much a surface on a part may deviate from an ideal plane. The Tolerance Zone for a Flatness Tolerance is based on two parallel planes. One lies at the peak of the tallest irregularity in the surface. The other lies at the deepest trough of any irregularity of the surface. The surface controlled must lie entirely within the space between the two planes. The distance between these two planes is the Flatness of the surface. Since Flatness refines a surface, it may be used in a Tolerance Stack. These two are often confused, but in fact they’re quite different. Parallelism uses a datum to control a surface but there are no datums associated with Flatness. A surface may be within flatness tolerance but not parallel to any other surface or datum. Think of Straightness as the 2D equivalent of Flatness. While Flatness is measured over a plane, Straightness is measured over a line. Flatness is typically measured by sweeping an indicator, probe, or other sensor over the surface. The sweep must be in a plane parallel to the desired flatness measurement plane. One way to achieve this measurement is to place a dial indicator such that its tip comes up through a hole in a surface plate. Place the surface to be measured face down on the surface plate and sweep it over the indicator tip. The range of indicator travel must be less than the specified flatness tolerance. Use of Flatness in a drawing is straightforward. 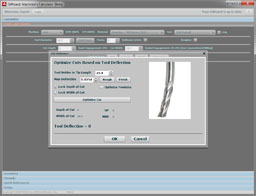 Simply callout the Flatness allowance in a feature control frame with an arrow leader designating the surface being controlled. The Flatness feature control frame may also rest on an extension line for a dimension of the surface. Flatness and Surface Finish are typically on quite different scales, with Surface Finish being a much finer scale. Most Surface Finish measurements are averages of some kind, while Flatness is a worst case. Click to visit our reference page for more information about Surface Finish.